I found an article in BBC’s News regarding the re-entry procedures followed by space shuttles like Discovery. This article explains the various steps involved in returning to earth graphically. Have a look at it I am sure all of you would like that. 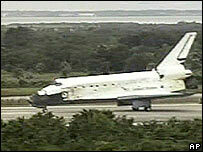 BBC World reports that the Discovery space shuttle has touched down earth safely at Kennedy Space Center in Florida at 1314 GMT on 17th July 2006.